Lockers are the crash-pad to books, homework assignments, stories, tennis shoes, smelly socks, prized possessions, love notes (and break-up letters,) trash, food, and even sometimes: ART. Installed as a prominent feature of the Edith O’Donnell Arts and Technology Building, banks of yellow lockers line each floor of the School of Arts, Technology, and Emerging Communication (ATEC) at UT Dallas. In 2017, ATEC designated a special bank on the first floor as the Locker Gallery, to house a permanent collection of locker-based art. 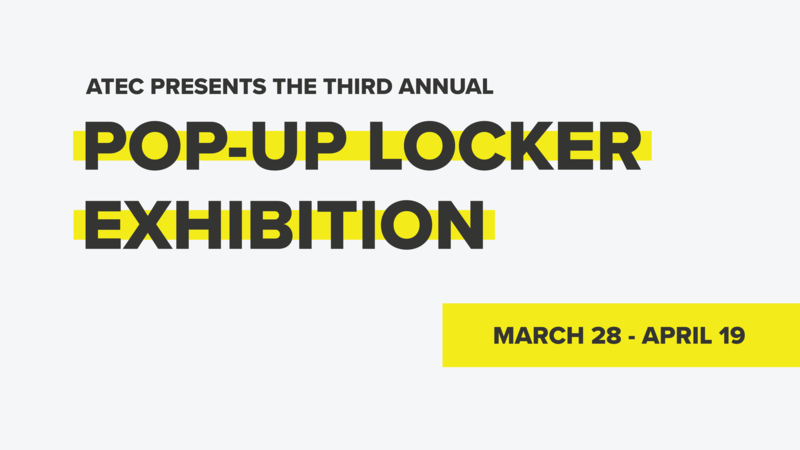 A signature spring event at ATEC, the juried ATEC Pop-up Locker Exhibition features the permanent collection of installations created by students, and a new piece by a visiting artist. Exhibit installations have been a remix or restaging of work, interpretations of poetry, sound, yarn bombing, and works made for and about the locker. Experiencing each locker provides a 3-foot glimpse of the artist who occupies it. This year, we are particularly interested in art that addresses the theme “Freedom of Expression”. In 1998, media scholar and artist Kembrew McLeod trademarked this phrase and published a series of zines under the Freedom of Expression™. After the trademark expired, ATEC Associate Professor xtine burrough registered it, extending works created for the Freedom of Expression™ series to locker art in the ATEC building. Freedom of Expression™ catalogs showcasing the exhibit will be created by a team of ATEC students. The Locker Exhibition features the work of Invited Artists and collected works from previous years alongside locker art created by UTD students. Dr. McLeod’s zines will be showcased in this year’s exhibition and archived in the Locker collection. We have also invited Christopher Blay, a Dallas-based artist, to exhibit work in a locker and to judge student submissions. Blay will select a student work to be added to the permanent collection, give an artist talk, and participate at ATEC Crit Friday on March 29, 2019.